One of the best parts of travel is seeking out authentic local experiences to understand the culture of an area, but often times it can be difficult to know where exactly to go. 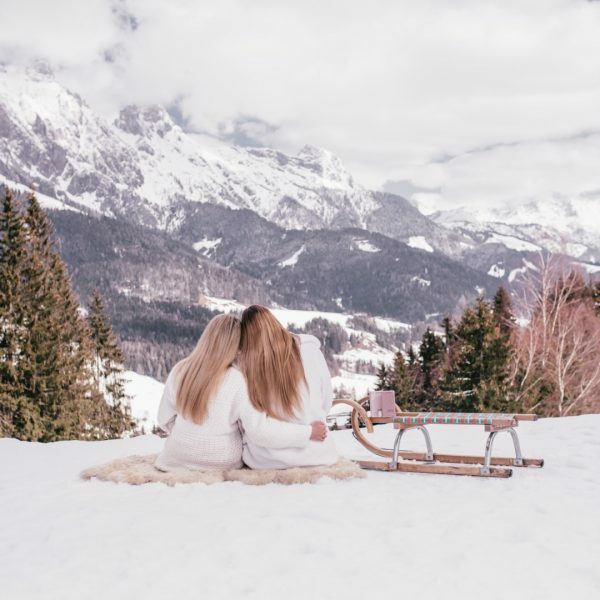 Many hidden destinations are now well known, and the advent of cheap travel deals has made it easier than ever to seek out new and exotic destinations. 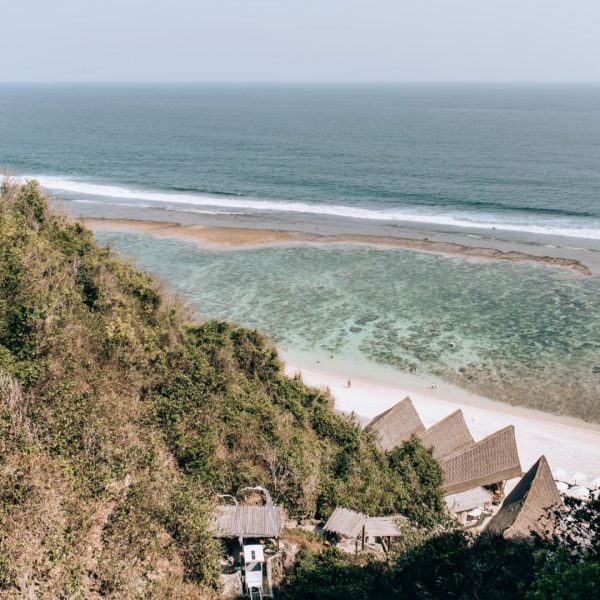 Bali is certainly one of those places, recently named Trip Advisor’s Number 1 destination in 2017, the island is full of tourists eager to explore the lush green Indonesian paradise. So what do all these tourist do when they get to Bali? As Instagram shows, they ride on epic swings, explore monkey forests, jump in waterfalls, surf at the beaches and wander through rice terraces. But what’s beyond that? 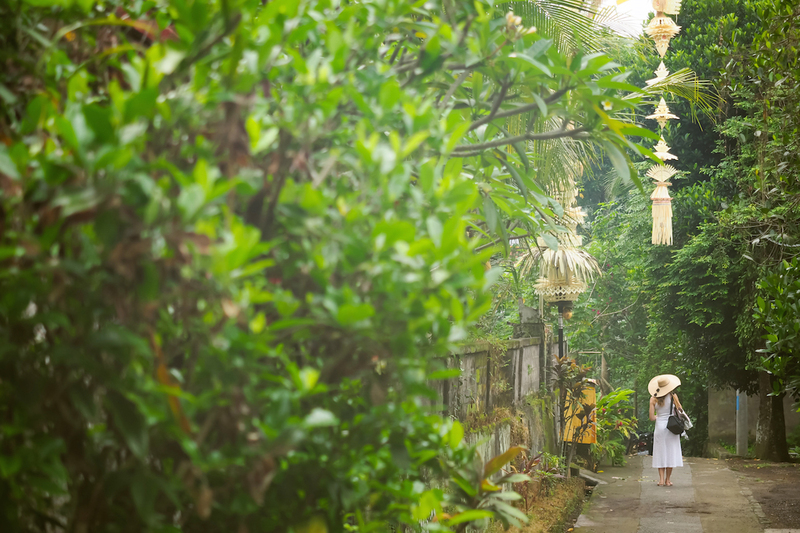 Is there a way to experience true Bali, meet with locals and learn about the Balinese culture? The answer is that whilst not impossible, it can be hard to have an authentic experience here. Most Balinese are understandably not willing to let strangers sightsee in their homes (well, would you let tourists wander into your apartment?! ), but there is one family in Bali that does just that! That family is Frances, Adi and their daughter Santi. 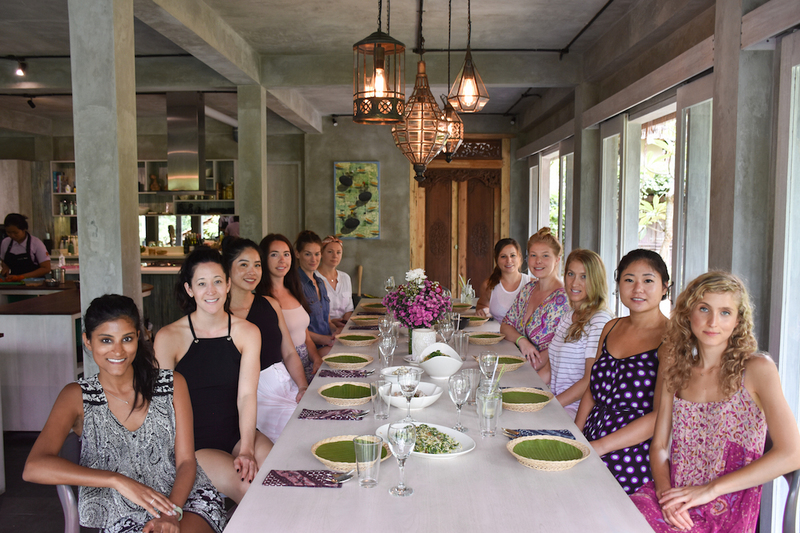 Living in Ubud, Frances and Adi are the founders and creatives behind Tresna Bali Cooking School, a 10 year passion project that led to them opening their doors to guests earlier this year. 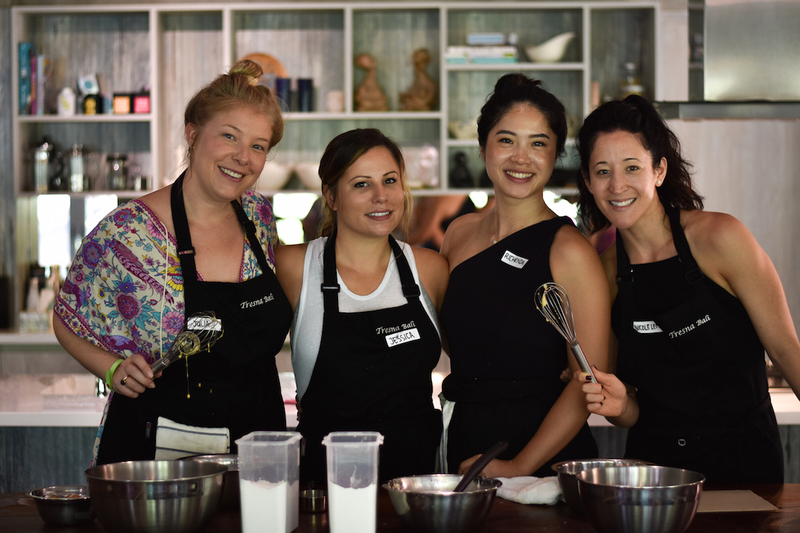 We took the girls on our recent Travel Girls Getaways Bali Retreats to the cooking school to give them a taste of the real Bali. Frances and Adi, a Canadian woman and Balinese man, met and married in Bali and then went on to build a successful wedding and events company. Whilst their business was doing great, they found it was hard to fit the work in between their commitments to their village as holy people. 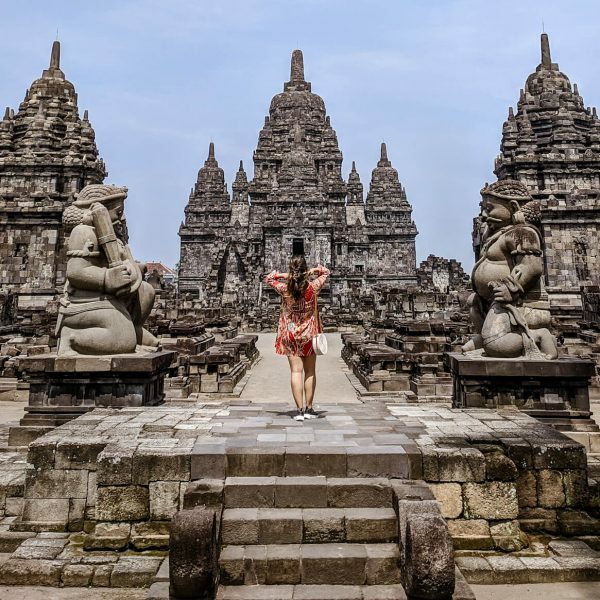 If you have visited Bali before you will know that ceremonies happen a lot, so they had to find an alternative business that they could fit around their religious responsibilities. 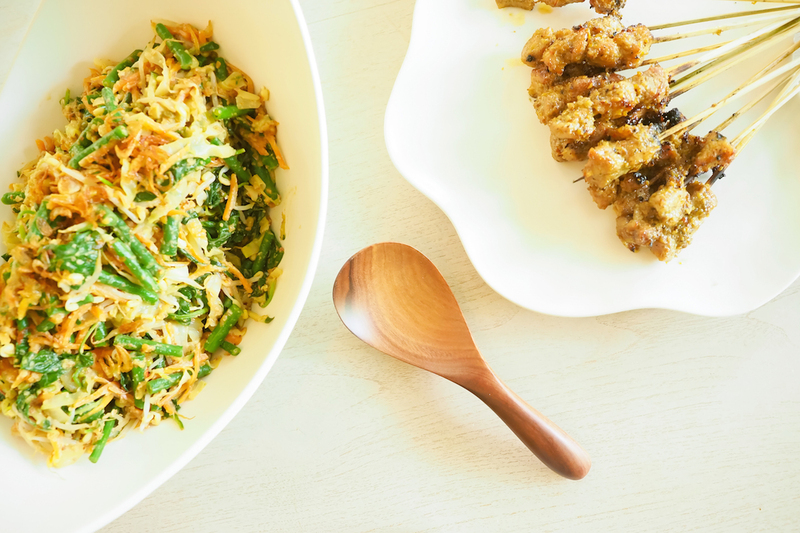 Adi is a passionate cook, and loved sharing his recipes with friends visiting Bali. So over the years when they would invite people over for dinner and cook them a traditional Balinese meal, they always received the same reaction of “this is the best meal I have had in Bali!” Over time, their friends would recommend them to other people visiting the island. At this point, Frances and Adi started to have random visitors to Bali emailing them wanting to come to their house and pay to experience the traditional Balinese cooking even though they were not a restaurant or cooking school at that point! They soon began looking for land to build a property and cooking school, and eventually found the perfect spot in Ubud. 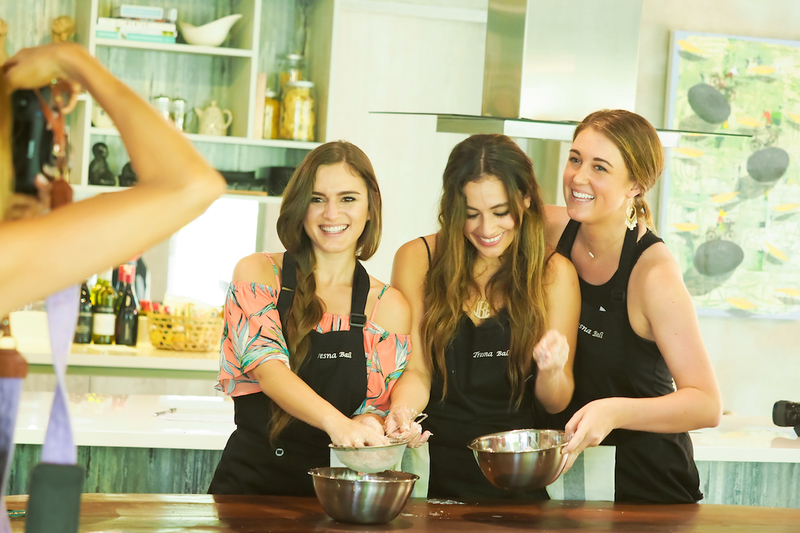 After many years of hard work they have created a luxurious boutique cooking experience, which perfectly marries cooking in a modern kitchen with the traditions of Balinese cooking that Adi has practiced since childhood. 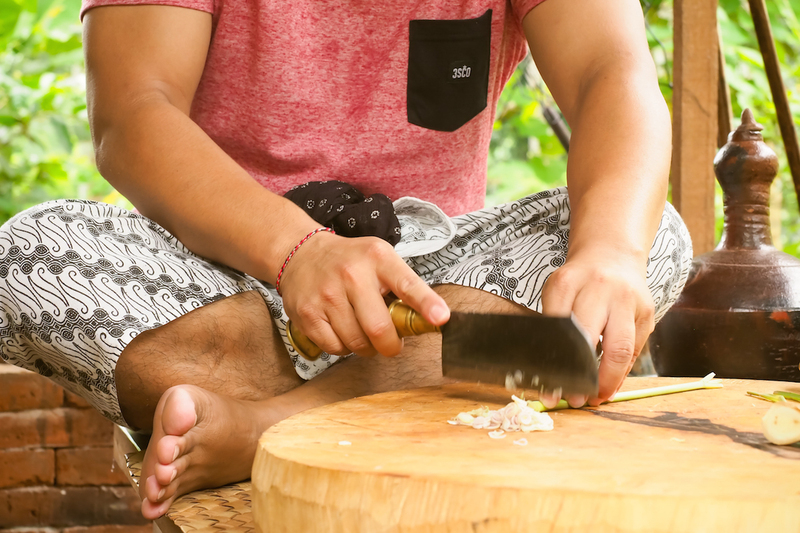 They continue to run both their events and cooking school businesses, but the cooking school allows them to continue with their commitments to the village and also welcome guests from all over the world to share Balinese traditions and food! Tresna Bali is located in Ubud, an easy 45 minute drive from Seminyak/Canggu, or a quick 10 minute drive if you are staying in Ubud centre. Your driver may tell you he can’t drive down the gang (road) to the school as it is too narrow so you may have to walk 5 minutes from the main road – but this is an experience in itself, passing local family homes and maybe meeting a few of them along the way! Your day starts early, heading to the school for arrival at 8:45am where you will be greeted by Adi, Frances and their friendly staff. You begin with a delicious fresh drink of coconut water and lemongrass to refresh you as you get started with the meal preparation. But first Adi will take you on a tour of the property, exploring their garden where many of the ingredients you will cook are grown. It’s Adi’s goal to continue to grow the garden so that all of the ingredients used in the cooking school are grown there. He will also show you the outdoor kitchen where much of traditional food preparation and cooking takes place in Bali. 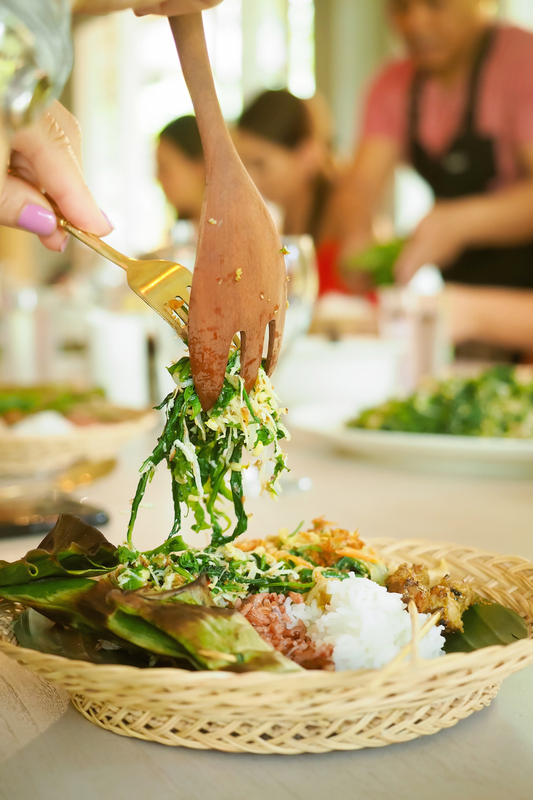 The food cooked at Tresna Cooking School is traditional Balinese ceremonial food, which means that you won’t get to eat it anywhere else in Bali unless you are invited to a local ceremony. The food is wonderfully unique and definitely not the usual Nasi Goreng that you will find in the restaurants. This means you truly are tasting and experiencing the real Bali and eating as the Balinese do, which is a rare opportunity for foreign visitors! Much of the cooking at the school is actually in the preparation of various spice pastes that are used for the meals. The girls’ favourite part of the day was making the homemade coconut milk, extracting the milk by hand from the mature coconuts in Tresna’s garden. In my opinion, the best part of Tresna Bali is at the end of all the cooking when you get to eat what you have created! 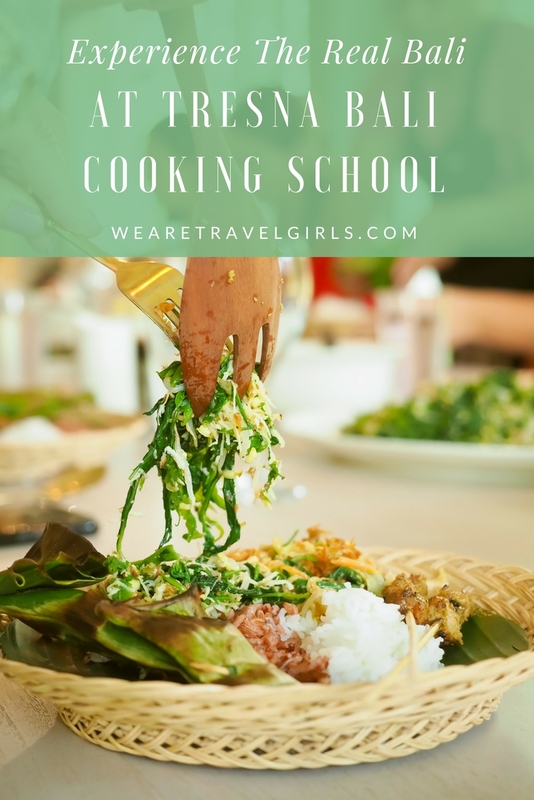 I can sincerely tell you that the food I have eaten on the 3 times I have been to the cooking school has been the best Balinese food I have eaten on the island, and I think all of the girls that we took to the cooking school would agree! The food is not only delicious but also very Insta-worthy. 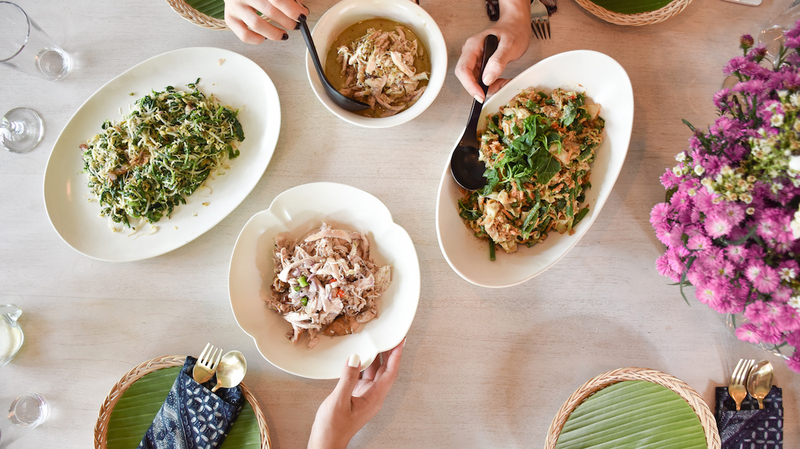 Tresna Bali take huge pride both the taste and the presentation of their food, and every dish is delivered with love to the table and you won’t be able to stop yourself from climbing up on your chair to take an over table shot! 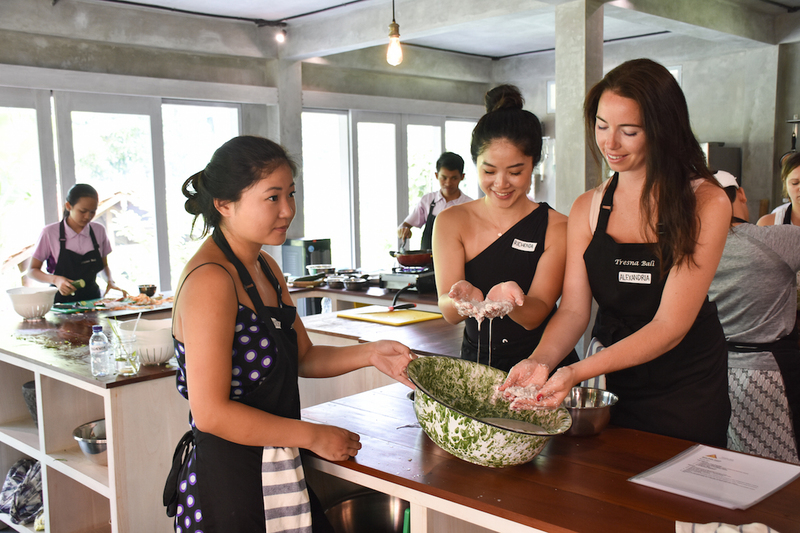 The next step for Tresna Bali Cooking School is to offer immersive cooking experiences for guests to stay with them at the school to immerse themselves in Balinese cooking, shop for the ingredients at local markets and then spend a week learning from Adi all about Bali food. 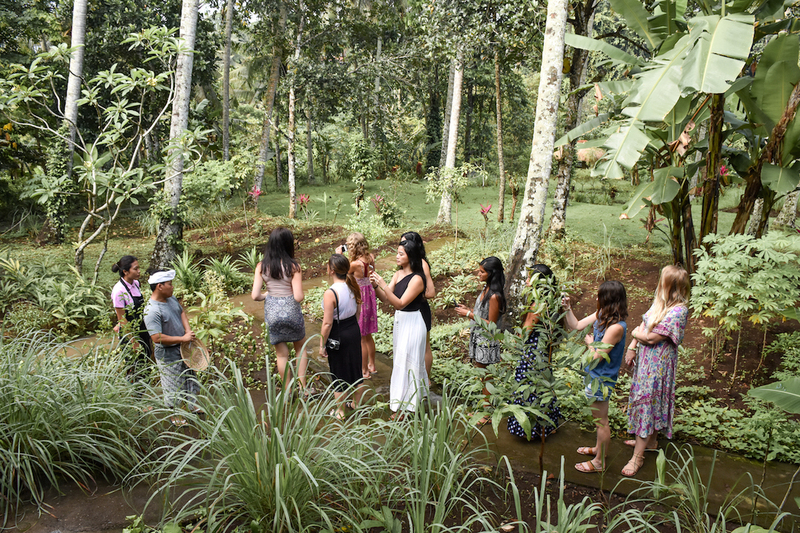 Watch our vlog from the day at Tresna Bali with our Bali Retreat guests and follow our YouTube Channel to see weekly vlogs and destination videos from the We Are Travel Girls Founders Becky van Dijk and Vanessa Rivers. I’m still dreaming of those pandan pancakes!!! What a wonderful experience. Everything was blessed from the garden! I believe the greatest lesson learnt from Tresna Cooking School is that you cannot find more healthy and fulfilling food anywhere else, but in your own garden and kitchen!